The WS.WebTV API has been designed to allow the integration/interaction between other applications and the WebTV. It was launched with WS.WebTV version 1.8 and with each new version we have added new functions. Our intention is to continue adding more functions, over time. Before using the API the first thing you need to do is to create a Credential in the WebTV. Please note that you can create any number of Credentials. (A) To create an API Credential click on "New Credential" button. (B) To edit an existing API Credential click the corresponding "pencil" icon. The creation and edition interfaces are very similar, however, when you are editing a Credential you will see additional information. • Title: Enter a descriptive title for your own reference. • Requests expiration time: This is the maximum time (in seconds), elapsed from the request generation date, that a request will be accepted by the system. • Enable Statistics: When enabled the system will register statistics for the Credential. 4. Permissions... 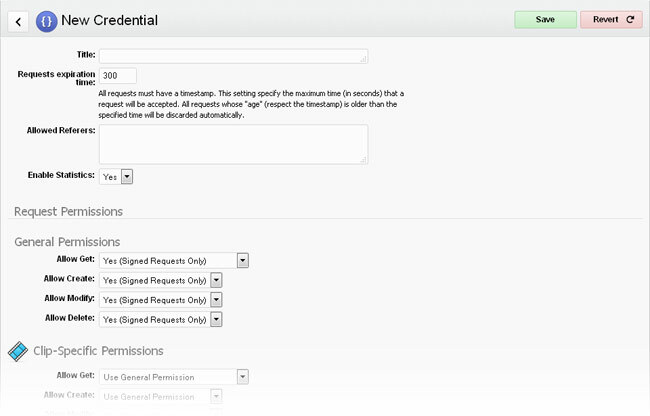 Select the permissions (general and specific) you want to grant to the Credential. Specific permissions allows some sections of the API to have different permissions than the general ones. • Key ID: This ID must be used publicly to identify the requests by this Credential. • Key (Shared) Secret: Be careful with this Key as it will be used to generate the validation signatures; therefore, you should never expose it publicly. This Key must only be "known" by the WebTV and your application. NOTE: The aforementioned Keys will only be generated once (at the Credencial creation). The API URL is the Base URL of your WebTV followed by "/api.php". NOTE: All request are performed using GET and POST. salt random string A randomly generated string for every request. key KEY ID This is the Credential "Key ID"
signature base64+HMAC SHA256 The generated signature (see below). NOTE: The signature is not required for those cases when you have allowed (in the Credential) unsigned requests. Except for those cases when you have allowed unsigned requests, all the API requests require a verification signature. The signature (hash) is generated from the concatenation of the salt and timestamp, using base64 + HMAC SHA256 with the "Key (Shared) Secret". 1. Secure your requests by using HTTPS in your API request URLs. This requires having a valid SSL certificate in your WebTV's server. This is specially important when dealing with User-related requests. 2. On the Web, always try to avoid sending requests to the API using a Front-End application. 3. Never expose the API Key (Shared) Secret and do your best to protect it. If you are using a Front-End application to send requests to the API (for example, a mobile App), then make sure the Secret Key is really secured or use a Back-End application to send the requests to the API and the result to the App. Also, always use HTTPS and avoid managing sensitive information from the App. By default, the API will return the result in JSON format; however, you can ask the return in JSONP format (with callback), by adding the GET vars "format" and "callback" to the request URL. The system caches "GET" requests for better performance. In case you (really) need an uncached result then you can ask it by adding the GET var "cache" to the request URL. NOTE: In order to adjust the cache "life" time, do so from Configuration > Settings > Cache and change the "API Cache Life" setting. IMPORTANT: Make sure the folder api/temp/cache has write permissions. You can verify this with the WebTV Diagnostics tool. The Credencial permissions only allow signed requests and no signature was provided. All, or part, of the required info (GET vars) is missing on the request URL. The supplied API Key ID was not found in the system. The request is older than the "Requests expiration time" specified in the Credential. The Credential does not have the permission required to perform the request. The provided signature does not match the expected signature. The Credential does not allow request sent from the referer.